There are many possible depreciation methods, but straight-line and double-declining balance are the most popular. In addition, the units-of-output method is uniquely suited to certain types of assets. The following discussion covers each of these methods. Intermediate accounting courses typically introduce additional techniques that are sometimes appropriate. Under the straight-line approach the annual depreciation is calculated by dividing the depreciable base by the service life. To illustrate assume that an asset has a $100,000 cost, $10,000 salvage value, and a four-year life. The following schedule reveals the annual depreciation expense, the resulting accumulated depreciation at the end of each year, and the related calculations. 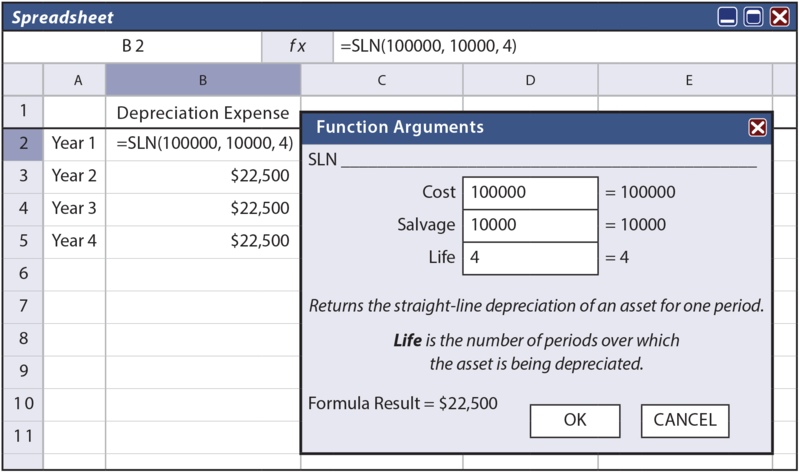 Computer-based spreadsheets usually include built-in depreciation functions. Below is a screen shot showing the straight-line method. Data are entered in the query form, and the routine returns the formula and annual depreciation value to the selected cell of the worksheet. The units-of-output method involves calculations that are quite similar to the straight-line method, but it allocates the depreciable base over the units of output rather than years of use. It is logical to use this approach in those situations where the life is best measured by identifiable units of machine “consumption.” For example, perhaps the engine of a corporate jet has an estimated life of 50,000 hours. Or, a printing machine may produce an expected 4,000,000 copies. In cases like these, the accountant may opt for the units-of-output method. The form of journal entry and balance sheet account presentation are just like the straight-line illustration, but with the revised amounts from this table. As one of several accelerated depreciation methods, double-declining balance (DDB) results in relatively large amounts of depreciation in early years of asset life and smaller amounts in later years. This method can be justified if the quality of service produced by an asset declines over time, or if repair and maintenance costs will rise over time to offset the declining depreciation amount. The amounts in the above table deserve additional commentary. Year 1 expense equals the cost times twice the straight-line rate (four-year life = 25% straight-line rate; 25% X 2 = 50% rate). Year 2 is the 50% rate applied to the beginning of year book value. Year 3 is calculated in a similar fashion. Note that salvage value was ignored in the preliminary years’ calculations. For Year 4, however, the calculated amount (($100,000 – $87,500) X 50% = $6,250) would cause the lifetime depreciation to exceed the $90,000 depreciable base. Thus, in Year 4, only $2,500 is taken as expense. This gives rise to an important general rule for DDB: salvage value is initially ignored, but once accumulated depreciation reaches the amount of the depreciable base, then depreciation ceases. In the example, only $2,500 was needed in Year 4 to bring the aggregate depreciation up to the $90,000 level. An asset may have no salvage value. The mathematics of DDB will never fully depreciate such assets (since one is only depreciating a percentage of the remaining balance, the remaining balance would never go to zero). In these cases, accountants typically change to the straight-line method near the end of an asset’s useful life to “finish off” the depreciation of the asset’s cost. 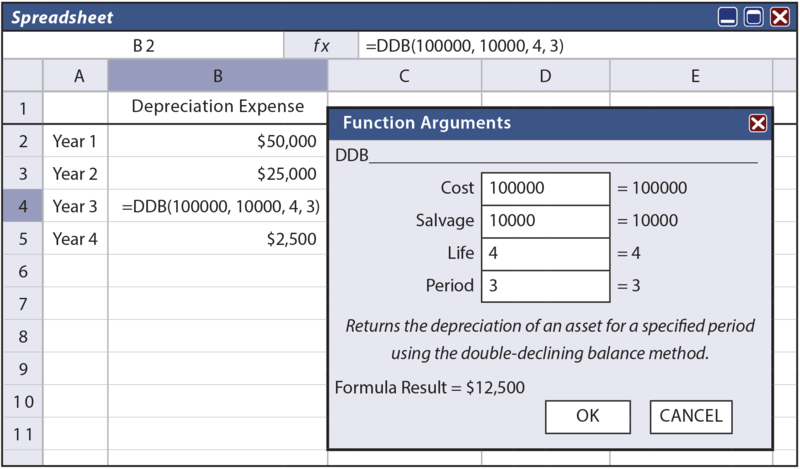 DDB is also calculable from spreadsheet depreciation functions. Below is a routine that returns the $12,500 annual depreciation value for Year 3. 150% and 125% declining balance methods are quite similar to DDB, but the rate is 150% or 125% of the straight-line rate (instead of 200% as with DDB). Obviously, the initial assumption about useful life and residual value is only an estimate. Time and new information may suggest that the initial assumptions need to be revised, especially if the initial estimates prove to be materially off course. It is well accepted that changes in estimates do not require restating the prior period financial statements; after all, an estimate is just that, and the financial statements of prior periods were presumably based on the best information available at the time. Therefore, such revisions are made prospectively (over the future) so that the remaining depreciable base is spread over the remaining life. Depreciation for Years 3 through 7 is based on spreading the “revised” depreciable base over the last five years of remaining life. The “revised” depreciable base is $50,000. It is computed as the original cost, minus the previous depreciation ($45,000), and minus the revised salvage value ($5,000). International accounting and reporting standards include provisions that permit companies to revalue items of PP&E to fair value. When applied, all assets in the same class must be revalued annually. Such balance sheet adjustments are offset with a corresponding change in the entity’s capital accounts. These revaluations pose additional complications because they result in continuous alterations of the amount of depreciation. Apply the straight-line method of depreciation, including situations involving partial periods. Apply the units-of-output method of depreciation. Apply the declining-balance method of depreciation, including situations involving partial periods. Be aware of declining-balance alternatives, such as 200%, 150%, and 125% rates. Know that electronic spreadsheets usually have built-in functions supporting depreciation calculations. How are changes in estimates (e.g., useful life) dealt with in the basic depreciation computations? Recognize that global approaches vary, and assets are sometimes revalued in global reporting.